Looks like most of America didn't want a felon in office. :whew: We'll see if we dodged a bullet, or fired one. I am fighting a cold, now - horribly sore throat, raspy voice. :sigh: I do NOT have time for this! Studio update: I am almost done with dish towel #3. I am absurdly slow right now - I am trying to make sure I am weaving correctly - it's been *3* years, after all! So, going slowly, watching my selvedges like a hawk...and revelling in the entire process. Dinner's in the crock pot, and the rain has subsided - I need to shower and get the kids up so we can head out. Hope y'all have a great day! Baby, it's Cold (and Wet!) Outside! Almost done with the toe of sock #1. Will start sock #2 after, because I want to push and get these DONE so I can whip out a pair for SG. Then it's kilt hose month! I also started a geek project. A while back, I had the idea of weaving a pair of Dr. Who shoelaces for Comic Con. Found a 4th Doctor Scarf pattern, matched the colors with embroidery floss, and started figuring out how to best warp my inkle loom so I could get them done. Weaving...didn't work. I tried 4 times - with 3 types of warp (the last being sewing thread). 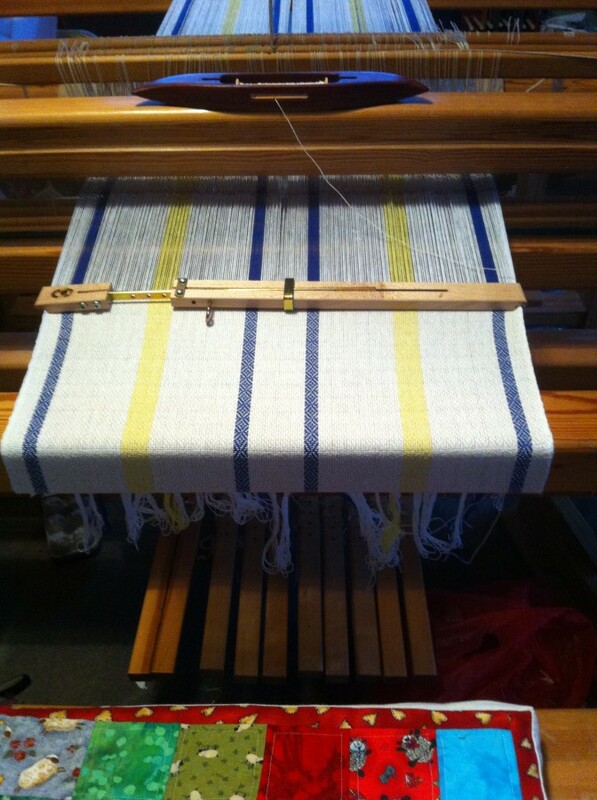 Inkle looms are made to weave warp-faced fabric (this means that the face of the cloth is the long threads that run length-wise. ); for these I need WEFT-faced fabric (the weft is the thread that runs width-wise in the fabric; usually carried by a shuttle. Most clothing fabric is balanced - you see both warp and weft. Navajo rugs/tapestries are weft-faced. ) 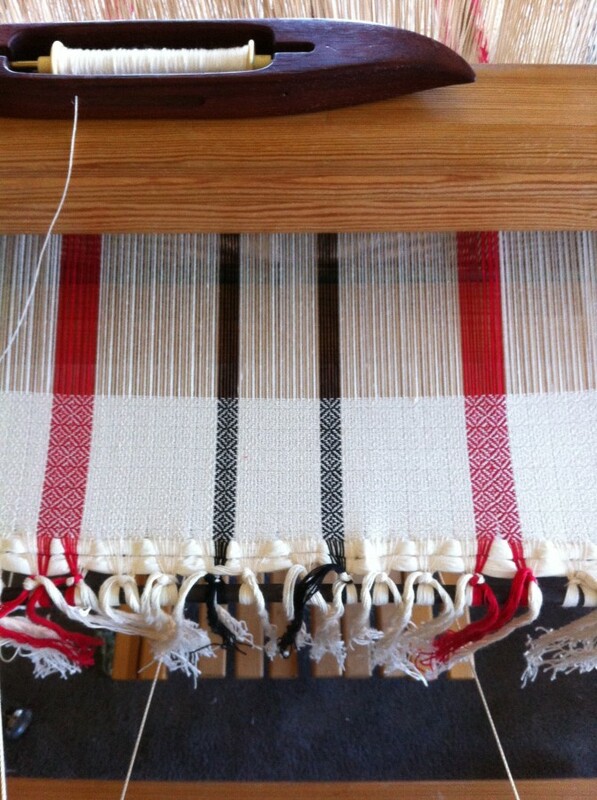 I tinkered with my loom, using fine-toothed combs to separate the warp, and started weaving....but my bands looked BAD. :sigh: Either balanced (which means I had white "dots" in the colored areas) or weft-faced but with horrible selvedges. After rummaging around in the Studio, I found a hollow wooden tube (NO IDEA what it belongs to/where it came from! ), so grabbed some finishing nails and made my own. It works Perfectly! I have about 1 foot of shoelace done......I'll work on it again after getting sock #2 started. :bounce: Dr. Who Scarf shoelaces - too fun! :lol: Judging from what I've got done, I think the scarf pattern will need to be split in half (the scarf is over 10 feet long IRL), with half on one shoe and half on the other. We'll see. My shoes were shipped out on Thursday, so this'll be fun. Comic Con is the first weekend in February - the reason I'm so geeked? Guests include: Billie Piper (Rose), John Barrowman (Capt. Jack Harkness! ), and - EEEEK!!! - Tom Baker (the 4th Doctor, of the SCARF.) :bounce: (Also scheduled are Jadzeea Dax (DS9), the Holographic Doctor (Voyager) and Ti'ilk (Stargate). Among others). I don't know that we're going to try for autographs - but we'll be able to see them. And I'll have a nod to the 4th Doctor with my shoelaces, and Rose and Ten with my shoes. :rofl: Should be fun! Wow - 3 for 3! 6. Herself had a doc appointment today. I'm...not sure about them - I haven't refilled her prescription for 2 months. The nurse we saw today? Didn't know that - the records apparently don't show refills. I didn't mention it - yet - because I want to make sure Herself is stable for more than 2 months before saying anything. Still, she's doing well, and I am pleased. Gotta skitter - I'm tired, and tomorrow will be busy. Hope y'all had a good Shavuot! I have a conference call for work-work today....ick. Ah, well....They estimate it'll take an hour. :sigh: Hope not...I've got stuff to do! I don't really like these made-up holidays, but I have to admit it's nice being spoiled! Today, I was taken to lunch at Chili's (which means I also have dinner and probably breakfast - the portions are SO large that I always get at least 2 meals out of each plate), then to North Haven Gardens, where SG bought me a lovely Bird of Paradise tree and 2 skull cap plants (more to come...he wants to plant them in between the roses under the studio window). To top it all off, we went to Half Price books.....and I managed to walk out of there with only 1 overtly school-y thing (the book "The Civil War Day-by-Day". It's AWESOME. And only $6!) - yeah, the Morgan Llewellyn books will be read-alouds (I discovered last weekend that my children are woefully deficient in their Irish mythos knowledge, so I aim to fix that), but they're mostly for my collection. I have the rest of the day "off".....:heh: I started the shawl yesterday (I decided to knit the Highland Triangle shawl from "Folk Shawls" (ravelry link). Pretty, easy, and relatively relaxing. Thank y'all who answered my survey....still need some more info. :grin: Ali, you have them priced the way *I'd* price them; however, in the online handwoven marketplace, dishtowels are selling for $20+ EACH. I think that's kind of high, but even locally that's what they go for. :blink: Yes, they last...but Oy, I can't think like that. 1. Monday was recover and hem the dishtowels day. Didn't get that accomplished - but I did get all the towels ironed and pinned. :shrug: It was also a major post-office day; we got all the books I had ordered for Himself (he's "ready" to start Trig....according to Singapore, anyway. *I* don't think he's really ready - he doesn't remember stuff we *just* studied - so I decided to hit the pause button and do Life of Fred as a review. I had most of them, but needed Geometry, Advanced Algebra, and Trig. ), and our new cheese press. Yeah, I caved - the one we built isn't sturdy, and was seriously starting to lean the last time we used it. This one was $99....but it's smaller and sturdier. 2. Tuesday was work.....and it sucked, because FA's office can't do their jobs. Or tell us when they update a program. :bangs head: 3 hours of my life lost because I had to upgrade to the new QuickBooks...which doesn't work correctly due to "known issues". :sigh: 'SAlright, though - I got it done. c) Placemats - yes/no? Again, how many in a set and do they have to be matchy-matchy? d) Do placemats and dishtowels have to match your decor, or does anything go? 2. I was reading Epbot the other day. Jen said that 90% of all women are wearing the wrong size bra. I thought "No way. Because I've been measured 3x at Bali, and they get the same size each time." and felt smug....until I thought about it. Because...they always measure me IN MY CLOTHES. :hmmmm: So...I grabbed a tape measure, went to the bathroom, and stripped...and measured. The band size didn't change. However.....to get the cup size, I did what was recommended - I bent over and let gravity help. Um.. Oh. My. For YEARS, I've worn a 34D. For YEARS, I've been uncomfortable (ignore the fact that everyone that found out my bra size told me that there was NO WAY I was a D-cup....my girls just aren't that big.) Well....they're WRONG. My correct size? 34H/34FF (depending on if it's US/UK sizing). :boggle: I have an 8" difference in my 2 measurements.....and I re-measured 4x before I accepted it. 3. Got the new bookcase set up last night...and SG HATES it. No, the wood wasn't perfect - it's a freaking BOOKCASE. It holds ALL my and Herself's craft books (WITH room to spare, I might add! ), and the colors look good. :sigh: He's already planning on building a "proper" one (plus the 2nd one I need....the books all fit on this one, but not the magazines. Of which I have...a lot. Still, *I* think it looks fabulous, and the Studio is coming along now - it actually is starting to look, well, nice. 4. I got the yarn armoire painted yesterday....it totally changed the "feel" of the piece. Normally, I dislike painted wood....but this? Gave the piece new life. (So did the paint job on the pie safe - it was a yucky, baby-poo yellow. Now? It's a lovely cottage blue. TOTALLY changed it - now I LOVE it. And before anyone yells at me - no, it wasn't an antique. It used old wood, but from everything we could tell, it's a fake. Even the kids' Granny, who is an antique hound, said it wasn't real - and I only paid $200 for it 15 years ago. It was either paint it or burn it...because it was UGLY.) I'm going to try to get photos this weekend, because...well, it's starting to look really good in there. 5. Our A/C went out this week. :sigh: Still, the Lord is good - it's 36* right now. Our A/C repair friend is going to come look at it this weekend....and it's supposed to be on the chilly side until Monday. 6. Remember the local weaving store? Yeah...I will NOT recommend them. It's been over 2 weeks, and we still hadn't heard about our special order. SG called yesterday...."Oh! She isn't going to carry that yarn anymore, and she didn't get around to actually placing the order for a while." 7. Shabbat Shalom! Tonight's menu includes pot roast (already smelling delish! ), rice, and challah. See ya on the flip side! 1. Been cleaning the Studio. I've just about given up on my idea of a perfectly organized space; there's just NOT enough storage in there, and a) I can't afford to buy it and b) waiting on SG to *build* me the storage I need is an exercise in futility. (See: door, pantry. Also: back, bookcase). 2. Doc. appt. tomorrow. Let's hope she doesn't find anything. 5. Herself finally decided on a plan for her tallit. Of course she has to be *different*....instead of white (like the rest of us! ), she wants deep, dark purple with a silvery-gray star pattern. Not hard to weave; it's just a totally new set of yarns. :sigh: and :lol: I have to weave the placemats first, though - the pattern she's chosen is overshot, and I'd rather screw up inexpensive cotton instead of the wool/silk blend. 6. Bjorn had an interesting hypothesis about the bombing.....I'm still digesting it. 7. Ali, I looked into the radiant floor heat when I had this house built. After ignoring the laughter ("This is TEXAS!! You don't need heated floors here!" :sigh: Yeah, I do - I feel the cold.) I figured out that it would up the build cost to a point that I couldn't comfortably swing the payments, and it wouldn't really cut my electric bill in the winter. It'd probably be cheaper to install in a place that actually *HAD* winters....but here, it's way expensive (because no one handles it). Ana White is in Alaska, and is currently installing it in her "Momplex"...you might hop over there and read about it. They're doing it under laminate, if I remember correctly, and showing all the steps. Interesting reading! Gotta skitter - got stuff to do before school! 1. Got a new bookcase built (but not quite finished). 6'x3'x1', in 3/4" poplar. It needs a back - seems that it's a little to large to be sturdy without one. The sides are a lovely "Mysteria" blue (think...gray undertoned French Blue), the inside is a soft dove gray. Lovely! But a lot of work. 2. Home Depot had picnic tables on sale - $49!! We bought 1, then decided to use it as a pattern to make another one for the goats to play on. :lol: We have a ton of scrap lumber to use, so the goat toy will be free...the best type! 4. Dishtowels! I can see the end of the warp! I think there's 2 more towels on the warp.....maybe. I just need to sit and weave. * I have a LOT of craft books. I feel that, while YouTube is nice and all, it may not be around all the time. (Don't try to argue the point....EMPs are a distinct possibility - no, they aren't permanent, but...still. I'm watching the gov't - they're trying to limit us plebe's access to the 'net.) I'd rather have a hard copy of instructions on stuff that'll be important later (clothing fabrication/woodstove cookery/animal care/etc) ON hand, so that if we're stuck with no electricity we can still do stuff that's needed. Do I NEED 50 books on knitting? Probably not - but I can't leave a useful book on the store shelf. :lol: SG doesn't agree...and he gets mad at me every time I purchase a book on some woodworking skill. :rolls eyes: Whatever...I'd rather have 'em and not need them instead of the other way around. So far. This AM Dulcinea presented us with a cute li'l buckling....:urgh: Never say that the Lord doesn't have a sense of humor - I can't keep this year's kid crop; we have TOO many goats now. So, ALL this year's crop is for sale....thus, the Lord has given us 2 bucklings - which I don't need *anyway*, and aren't tempted to keep. The next doe (Nubian) is due 4/19....the Nubians will pop off every 3 days, then the Cashmeres start. The Cashmeres were only in with Hobbes for 7 days, so I'm not sure everybody got bred...we'll see. The Nubians and Alpines are my main concern - they give us milk! State of me: I did NOT go take the tests yesterday. I got a new doctor Monday; I called Radiology to see if I should go ahead or not, and the tech said no, go ahead a cancel. Let the new doc order whatever tests she (yup, got a woman this time!) wants. I feel better, and I feel comfortable with the new doc - she homeschools, so at least I shouldn't have problems scheduling stuff around *our* school schedule. I see her next week. Oh! Next week is Israel's birthday! Iyar 6 (This year it's April 16) Israel turns 65! Happy Yom Ha'atzmaut! I don't have a Primary Care doctor; I am almost never sick, so don't see the need. The ER wouldn't release me without one, however, so they set up an appointment with the local clinic....which.....um. Thursday, I got the prescription filled, and promptly slept all day. Friday, my appointment was at 10 - SG took off work and took me there, but had to run home to help the kids get the goats in the back yard. So...I was on my own when they *finally* called me back. First, they took me to "Financial"...where the demeanor changed when they discovered that Hey! I have Private Insurance! I don't qualify for Gov't subsidy! (Red Flag #1). I waited another 15 minutes before being taken back to the exam room. Doc comes in, shuts the door. Red Flag #2 - NO nurse in the room. OK, I can deal. He asks the basics, asks about my allergies ("I'm allergic to Penicillian and ALL pain-meds. ")...then tells me he wants me on *aspirin*. :"Um. I'm ALLERGIC." "Oh, yes. Then I will write you a prescription for Plavix." "Wait - what? What is that a derivitive of?" "Oh, I don't know." "Um.....I really don't want an ALLERGIC REACTION to something..." "Oh, right. Well, I guess we have to try other things first." Dude. I said NO. No means NO. Why keep asking???? I'm getting uncomfortable here - it's just me and him in this little room. He decides that the ER didn't do a good job on the bloodwork, so orders more, and then orders an Echocardiogram and...some sort of Cranial something. Because the tests the ER ran "weren't enough. And sometimes you can have a stroke and it doesn't show on the CT scan. Even if you have NO symptoms afterwards. And they didn't check your thyroid." And I also MUST go get my eyes examined again. Okie-dokie....he leaves, and the nurse comes in and takes me to the "lab". I give more blood.....at this point, I don't even care, just get me OUT of there. Anyway, I feel fine. A little tired (what? I've been SLEEPING off and on for 4 days now! :lol:), but that's normal for this time of year - I'm on kid-watch. Dulce is STILL huge....and due Tuesday. I'm going to up my Vit D (after the tests on Wednesday....don't want anything odd to show up that would cause MORE testing.) and keep on keepin' on. 1. We almost got creamed by the LARGEST truck I have EVER seen today - the FBI have brought in a mobile command center, and they needed gas. At the pump we were just vacating. HUGE doesn't cover it. Awesome and scary do. I wish them luck in their endeavors. 2. Studio clean-up time! Herself and I got the free desk cleaned up and painted Friday afternoon before the rains hit. It's....Pink! - not the color I had anticipated from the sample. It was supposed to be a nice cranberry...oh, well. It works. And we have SPACE in the sewing corner now - all 3 machines (my sewing machine, Herself's sewing machine, and my serger) all fit, WITH room to spare. The patterns are neatly filed in 1 drawer, all the thread is in another, and the 2 bottom drawers hold the machine parts and misc. sewing tools. 4. SG is off today (he had to work Friday, so his boss "made it up" to them today)...so no school. We'll make it up tomorrow. 5. The kids spent most of yesterday doing yard work. SG had bought 8 roses and 2 apple trees; I now have 5 rose bushes under my studio window. It'll be nice when they start blooming. The other 3 roses are by the front gate; the 2 trees are replacements for the 2 we bought last year that died (and were still under warranty - free trees for the win! :lol:) He also bought me a pretty purple magnolia....it's in line with my window so I will see it every time I look up from the loom. It's cool and drizzly here - good thing. We NEED the rain. Badly. This is the current project. "Julia" dishtowels from a pre-wound warp from Glimakra USA. A few problems in the warping - it was wound for warping back-to-front; I warp front-to-back - but I overcame them....and I LOVE how they're weaving up. Sabbat Shalom - and may your day be blessed! Lost of stuff's been happening this week, aided by the fact that we are on Spring Break. And I only have 1 kid at home. So, I give you Photos! The studio is almost all set up. The dining room is almost cleared of my craft stuff; can't finish until I have a bookshelf to put the books and magazines on. The other little stuff is just waiting until I get the studio organized......my problem? The table loom(s). The weaving width of a loom tells you the maximum width you can weave - that's NOT the width of the finished fabric, mind you - you lose probably 2", maybe 3", when you wet-finish it - which means you can weave fabric UP TO that width. So, my 60" loom will weave a piece of fabric that finishes out at approx. 56" wide. 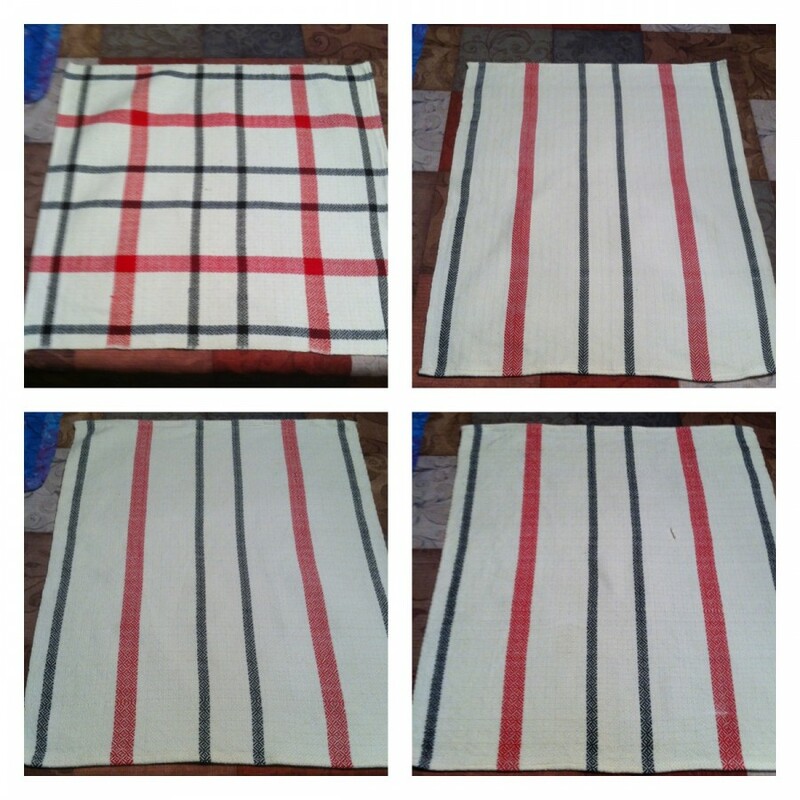 Wide enough to do a tablecloth in 1 piece, or a bedspread, or curtain fabric for wide windows. I can also weave narrower things - placemats, dishclothes, etc. So...why do I hang onto the 22"? Because of "loom waste". See, EVERY loom has a length of warp yarn that it can NOT weave. My big monster of a loom wastes about 1 - 1.5 yards of yarn on EVERY warp - because of the depth from the last shaft to the back beam, and the amount of yarn it takes to tie onto the cloth beam in front. I've tried various ways to cut down on the waste - tying on a "dummy warp" (but then you have to tie ALL your warp threads to it and hope the 400+ knots hold :ick:), "lashing on" to cords attached to the beam (works to the end of the warp, then I run into MAJOR tension issues - I lost about 2 yards that time. :sigh:)......it's just a fact of life that I need to add 1 yard in length to every project. The LeClerc has been for sale for 2 years now...I have it for $500 - brand new it's $1,770. NOBODY has even nibbled on it. :sigh: I've only used it about 5 times - I just don't like multi-shaft weaving. 8S will be enough fun, I think....12S was overkill. (In fact, I never used more than the front 4 shafts on it...funny, huh? :lol:) (The more shafts you have, the fancier patterns you can do. I'm happy exploring 4S patterns; 8 will send me over the moon!) I really don't want to mark it down any more......but it's OK right now, since it's not *here*. I dunno.....I have all this space, and it feels like it's still not enough room. I had offered to downsize my Glimakra - I used to have a 45" loom, and it was nice; I'd just have to piece larger items - but SG said emphatically NO. (Which made me happy - this was and is my dream loom!). It's just SO BIG.......I'll keep moving things around until it "clicks". The loom is where it is - there's really no other place to put it but in the middle of the room - but the rest of the stuff can be shuffled around.